President Barack Obama spoke during a memorial service for five police officers killed in an ambush last week in downtown Dallas. President Obama helds hands with his wife, Michelle, and Dallas Mayor Mike Rawlings at the interfaith memorial service in Dallas Tuesday afternoon. President Obama spoke during the memorial service. Former President George W. Bush also spoke, as did Dallas Mayor Mike Rawlings and Dallas Police Chief David Brown. President Obama at the memorial service in Dallas Tuesday afternoon. Former President George W. Bush spoke at the memorial service in Dallas. A woman sat beside photos of the slain police officers. Dallas police officers outside of the Morton H. Meyerson Center in Dallas. Inside the Morton H. Meyerson Center for the memorial service. Obama spoke today at the memorial service for the five, honoring the work of law enforcement officers, saying they answer a call that at any moment, even in the briefest of interactions, may put their life in harm's way. Obama attended the memorial along with first lady Michelle Obama, Vice President Joe Biden and his wife, Jill Biden, as well as former President George W. Bush. Obama said Americans can't dismiss protesters who call attention to racial issues 50 years after the Civil Rights Act as troublemakers. Obama said that Americans know that bigotry remains, some are affected by it more than others and that none of us "are entirely innocent." He also said that the country asks police "to do too much" and that we do "too little ourselves." Obama delivered his remarks at an interfaith memorial service at the Meyerson Symphony Center in the Dallas Arts District. He is scheduled to meet with the families of the fallen police officers and those injured in Thursday night's shootings. Programming note: Tonight at 7, KERA 90.1 FM will re-broadcast today's interfaith memorial service. President Obama talked about each of the officers, praising them for their work and for protecting the city. Obama talked about how Dallas police helped a woman who was shot as she tried to shield her sons in the aftermath of last week’s shootings. The reward of police work “comes with knowing our entire way of life depends on the rule of law,” Obama said. Some wonder if racial problems can ever be bridged, Obama said. Dallas has shown the country the meaning of perseverance and character and hope, Obama said. “That’s the America I know," the president said. President Obama says Americans can't dismiss protesters who call attention to racial issues 50 years after the Civil Rights Act as troublemakers. Obama says that Americans know that bigotry remains, some are affected by it more than others and that none of us "are entirely innocent." Obama thanked Mayor Mike Rawlings and Police Chief David Brown for their leadership. “We could not be prouder of you,” he said. Mayor Mike Rawlings introduces Dallas Police Chief David Brown as a native of South Oak Cliff – and the crowd gave him a standing ovation. “He not only represents Dallas but officers across the country and the higher calling of police work,” Rawlings tells the crowd. Until the day is night and night becomes the day. Did you know that you're loved by somebody? Until the day the earth starts turning right to left. Until the earth just for the sun denies itself. Until the day that you are me and I am you. Former President George W. Bush applauded the courage of the fallen officers. Bush talked about the special role officers play in society. None of us are prepared or could be prepared by an ambush of hatred and malice, he told the audience. Disagreement deescalates too quickly into dehumanization, and this has strained our bonds of understanding and purpose, Bush said. “We are bound by things of the spirit … by a shared commitment to common ideas,” he said. Sen. John Cornyn thanked Dallas leaders for their strength and grace. Cornyn praised the officers who put their lives on the line. “I believe they chose to confront evil and overcome it with good. They overcame evil by running toward the sound of the gunfire. They overcame evil by shielding their fellow citizens from the spray of bullets. They overcame evil by sacrificing their own lives so others could live. … The city of Dallas overcome the evil from that day. Amidst our profound sadness, we honor these Dallas officers for putting these people before themselves. In their final moments, serving others, protecting this city and loving this community as they did. Imam Omar Suleiman, Rabbi Andrew Marc Paley and Dr. Sheron C. Patterson are the interfaith leaders speaking at the service. Patterson praised Dallas Police Chief David Brown for his leadership. Suleiman continued: “Let the children of our fallen officers and others who have lost their lives to senseless violence are molded in the love we express today, not the hatred that claimed the lives of their fathers. Dallas Mayor Mike Rawlings is the first speaker. "At 8:58 p.m. five days ago, the soul of our city was pierced when police officers were ambushed in a cowardly attack. In the days that followed, we’ve sobbed and paid tribute at a growing memorial at the police headquarters. We’ve prayed together at Thanks-Giving Square. We’ve lit candles to honor the lives of our five heroes." Rawlings thanks elected officials from other states and cities who have traveled to the service. “These men and women are here with us because they know we have a common disease. This absurd violence on our streets. Those who will help us fight it are our men and women in blue, our peacemakers in blue. They have died for that cause. … We offer our gratitude to you, our cops, including those who have traveled to support your brothers and sisters …"
Rawlings talked about the spirit of the city of Dallas. The crowd applauded and gave a standing ovation. President Obama, Michelle Obama, Former President George W. Bush and Laura Bush have arrived in the Meyerson. The Star Spangled Banner is being performed. Somber music fills the Meyerson Symphony Center in the Dallas Arts District as law enforcement, loved ones and others honor the officers. Law enforcement representatives fill every row in the audience. President Obama has landed at Dallas Love Field and is expected to arrive soon. Five empty seats are covered with folded American flags and police hats -- each seat representing a fallen officer. Dallas Mayor Mike Rawlings is expected to speak, as are interfaith leaders, who will offer prayers. President Obama and First Lady Michelle Obama arrived at Dallas Love Field right before 12:30 p.m. They were followed off Air Force One by U.S. Rep. Eddie Bernice Johnson, Sen. Ted Cruz and other elected representatives. They were greeted by Vice President Joe Biden and Jill Biden, as well as Fort Worth Mayor Betsy Price and Dallas County Judge Clay Jenkins. President Obama has placed telephone calls to the family members of Alton Sterling and Philando Castile, two black men killed in separate police shootings last week that sparked protests around the country. White House spokesman Josh Earnest says Obama made the calls aboard Air Force One as he flew to Dallas. Earnest said the president offered condolences on his behalf and first lady Michelle Obama's, as well the American people. Valerie Castile's brother, Tracy Castile, said his sister had been invited to Tuesday's memorial service for the five police officers slain during a protest over the death of Castile and Alton Sterling, who was killed by police last week in Louisiana. But Tracy Castile said his sister chose to stay in Minnesota to focus on her son. Valerie Castile said she was ecstatic to get the president's call. Dorothy Wilson traveled with her husband from Shreveport, Louisiana, just for the service. She’s in Dallas to show her support. Vivian Morales of Mesquite said she showed up outside the Meyerson because she wanted to be with the officers who have lost loved ones. She said things are tense in the country right now. The private service will take place around 12:40 p.m. at the Morton H. Meyerson Symphony Center in the Dallas Arts District. Obama will be joined by former President George W. Bush, the vice president, both Texas senators and a host of other dignitaries. Elected officials from across Texas will be in attendance, as will law enforcement officials. Obama is expected to address violence in Dallas and across the country. Sen. Ted Cruz is among the lawmakers accompanying President Obama aboard Air Force One as he travels to Dallas to speak at an interfaith memorial service for five police officers killed on Thursday. White House spokesman Josh Earnest says Tuesday that Cruz's presence, as well as speeches from former President George W. Bush and GOP Sen. John Cornyn of Texas, are examples of how the country is not nearly as divided as it might seem given political debates, campaign rhetoric and congressional dysfunction. Earnest says that "it's in moments of tragedy, that this unity is revealed." Klyde Warren Park will be showing coverage of the interfaith service taking place at the Meyerson Symphony Center. The park encourages guests to use public transportation or walk, if appropriate, to avoid road closures. President George W. Bush also will attend and speak at the Tuesday memorial, according to The White House. Former First Lady Laura Bush, U.S. Sen. John Cornyn and Vice President Joe Biden are set to attend as well. On Monday, Gov. Greg Abbott announced his wife, Cecilia, would attend the memorial in his stead while he recovers from an infection after suffering severe burns to his legs and feet, The Texas Tribune reported. The president is making the trip at the invitation from Mayor Mike Rawlings. For security reasons, Dallas police cannot publish specific street closures, but drivers should expect significant delays, according to the department blog. Dallas Police Chief David Brown said at a news conference Monday that the Arlington Police Department has offered to work with the Secret Service to provide security during the president's visit. Brown said he doesn't want his own officers shouldering that responsibility because of "the fatigue factor." 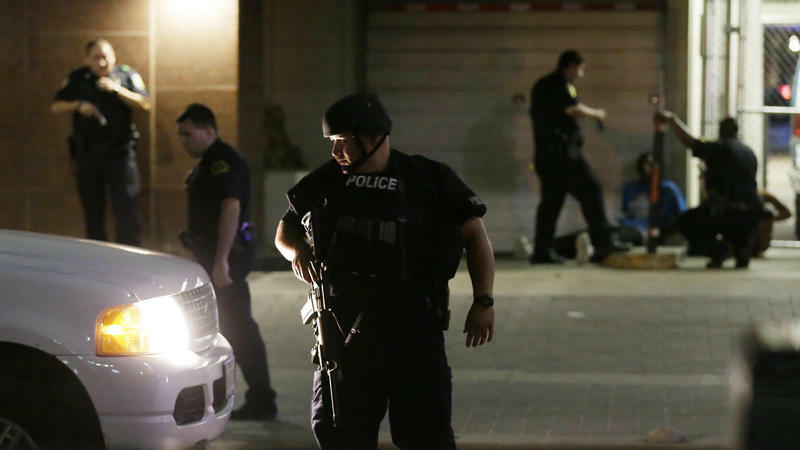 Five officers were killed and nine were wounded when a gunman opened fire on a protest march in downtown Dallas on Thursday evening. Two civilians were also hurt in the ambush. After hours-long negotiations with Micah Xavier Johnson turned into an exchange of gunfire, the police deployed a robot armed with an explosive, killing the 25-year-old suspect. The attack occurred shortly after Obama had arrived for a NATO summit in Poland. He cut his visit to Spain short by a day and has spoken daily during the trip about the attacks, calling for police and protesters to "listen to each other." Obama said protesters who attack police officers are doing a disservice to their cause. Obama said in Madrid after meeting with Spain's acting prime minister that one of the great things about America is that individuals and groups can protest and speak truth to power. He said the process is sometimes messy and controversial, but the ability to engage in free speech has improved America. Obama also cautions that if protesters paint police with a broad brush, they could lose allies for their cause. At the same time, he said that when police organizations acknowledge there is a problem stemming from bias, it will contribute to solutions. Obama is cutting his first visit to Spain a day short because of a series of deadly shootings in the U.S.
For more coverage of the downtown Dallas shooting, visit this page of stories from KERA and NPR. Dallas police chief David Brown says the suspect in the deadly attack on Dallas police officers scrawled letters in his own blood on the walls of the parking garage where officers cornered and later killed him. Mark Hughes, wearing a camouflage shirt and legally, openly carrying an AR-15 rifle, was among dozens of black people in downtown Dallas on Thursday evening who were peacefully protesting against the recent back-to-back officer-involved killings of two black men. This is a developing story. Last updated 9:12 a.m. ET. 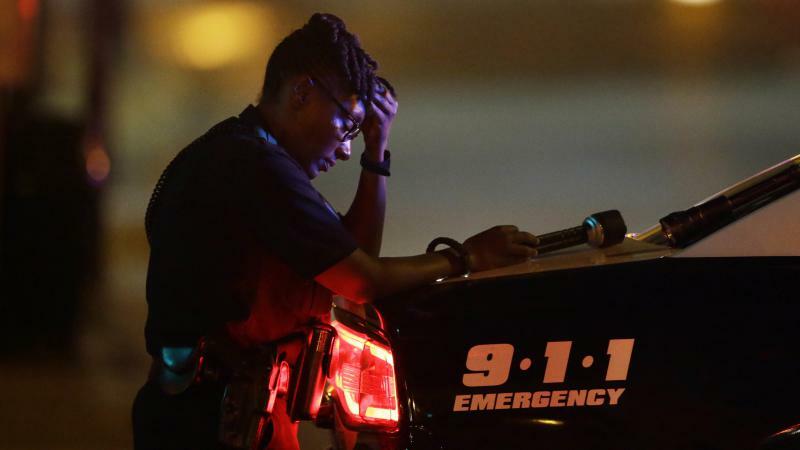 Snipers shot and killed five Dallas law enforcement officers and injured another seven at the end of a rally in downtown Dallas, where hundreds were protesting police shootings that happened in other parts of the country earlier this week. Four of the slain officers worked for Dallas Police; the fifth was identified as 43-year-old transit officer Brent Thompson, of Dallas Area Rapid Transit, or DART.